Perez-Pena, Richard, Voters Refuse to Take Chances On Bond Act and Convention, New York Times, November 6, 1997. 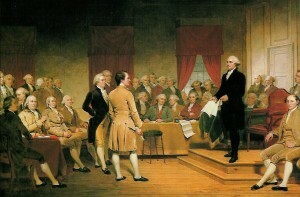 Perez-Pena, Richard, Voters Reject Constitutional Convention, New York Times, November 5, 1997. Precious, Tom, Voters Reject Proposal Calling for Convention, Buffalo News, November 5, 1997. Humbert, Marc, Coalition Mounts TV Ad Campaign Against State Constitutional Convention, Buffalo News, October 31, 1997. Nagourney, Adam, “The 1997 Elections: The Challenger; Messinger Opposes Constitutional Convention,” New York Times, October 29, 1997. Perez-Pena, Richard, Scorn for Albany Unites Forces Urging a New Constitution, New York Times, October 26, 1997. Kolbert, Elizabeth, Divisive Idea Calls Cuomo Out of Shell, New York Times, October 9, 1997. Dao, James, Pataki and D’Amato Back Constitutional Convention, New York Times, October 8, 1997.
Letters to the Editor, East Hampton Star, October 2, 1997. Perez-Pena, Richard, Constitution Is Stealth Issue of 1997, Attracting Strong Feelings, New York Times, September 27, 1997. Press Release, [O]nly 49 percent say they’ll vote for the Constitutional Convention, while 22 say they’ll vote no, with 29 percent undecided, Quinnipiac University Poll, September 25, 1997. Precious, Tom, Coalition Aims to Block State Constitutional Revision, The Buffalo News, September 16, 1997. Sorenson, Jon R., “Rudy Being Shown Pros of Gov’t ‘Con,” Daily News, August 11, 1997. Voters Favor Convention On State Constitution, New York Times, July 24, 1997. “Cuomo on the Record: Excerpts From Views On Campaign Issues,” New York Times, September 28, 1994. Sack, Kevin, “Race for Governor: Pataki Lists His Differences,” New York Times, September 15, 1994. Dao, James, “The 1994 Campaign: The Governor’s Race,” New York Times, September 15, 1994. New York State Bar Association, Report of the Task Force on the State Constitution, The Record, Vol. 52, No. 5, 1997. Benjamin, Gerald, and Henrik N. Dullea, Decision 1997 – Constitutional Change in New York, Rockefeller Institute Press, March 1997. Benjamin, Gerald, The New York State Constitution: A Briefing Book, Rockefeller Institute, 1994. Facts Regarding New York’s Constitution and Constitutional Conventions, Rochester Business Alliance, 1997. Editorial, “Constitutional Convention is our Chance for Change,” Buffalo News, October 23, 1997. Editorial, “Reasons to be Pro Con Con,” Daily News, October 19, 1997. Editorial, “Don’t Let Insiders’ Phony Fears Stop a Constitutional Convention,” Buffalo News, October 19, 1997. Editorial, “Ten Reasons New Yorkers Should Vote ‘Yes’ to Call A Constitutional Convention,” Buffalo News, September 7, 1997. Bopst, Christopher, “State Constitution is in Desperate Need of Reform,” Buffalo News, July 26, 1997. Governor Mario Cuomo, Temporary State Commission on Constitutional Revision, Executive Order 172, May 1993. Dao, James, Unions Oppose Constitutional Assembly, New York Times, November 1, 1997. Dao, James, The Ad Campaign: Attacking a Constitutional Convention, New York Times, November 1, 1997.